A week or so ago, we went to Nan Xiang Xiao Long Bao 38-12 Prince Sreet, Flushing, NY 11354, possibly my dad’s favorite restaurant at the moment. They’re famous for their soup dumplings so that’s a must, but many other dishes are wonderful as well. We had a light noodle soup with strips of pork and bits of green veggies called Shue Tsai, or snow cabbage. 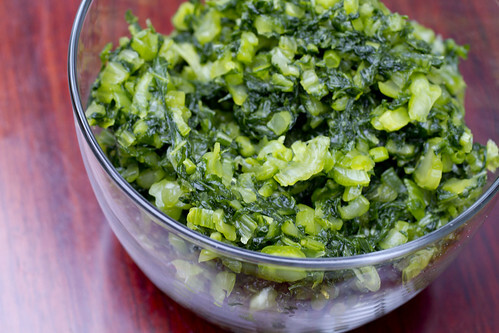 It’s found in several of my favorite Shanghainese dishes, floating among sauces and soups, adding a unique green and lightly bitter flavor with some texture that gives a nice rustle between the teeth. Snow cabbage is rarely cooked fresh as is, so it is understood that the snow cabbage has been shredded and salt preserved before using it in dishes. Snow cabbage has a very short season so you can fake these greens with small mustard greens (not the large kind used for Swan Tsai/Pickled Musatrd Greens). The taste and texture is mimicked quite well and you won’t notice a difference.